1. Magnetically folds into a portfolio case for portability and traveling. 2. High quality PU leather cover with soft inner lining provides comfortable feeling while offer full protection for your tablet. 3. With smart stand function, this keyboard case enables you to have a prefect viewing angle with your tablet. 4. Precise Cutout allows full access to all ports, user interface, sensors, speakers, microphone and cameras without having to remove the cover, even when you are charging the tablet. 5. Built-in Rechargeable battery could extend the battery life of your tablet (3 hours). 6. Special function keys: Sleep / Lock / Slideshow/Home/volume and more. Being a set Research and Development, Design, Production and Sales in cell phone and tablet accessories in one, we manufacture and sell cases for tablets and cell phones of many brands. By this way, we can always offer you the highest quality product with reasonable price. For your convenience, please search "IVSO + your tablet/mobile" to take the fastest path to the product you want and have a clear view of other cases we offer in store. 1.Exclusive design: Specially designed for iPad Pro 10.5 tablet, Compatible with New iPad Pro 10.5 inch 2017 newest released ONLY. (Model Number: A1701/A1709). 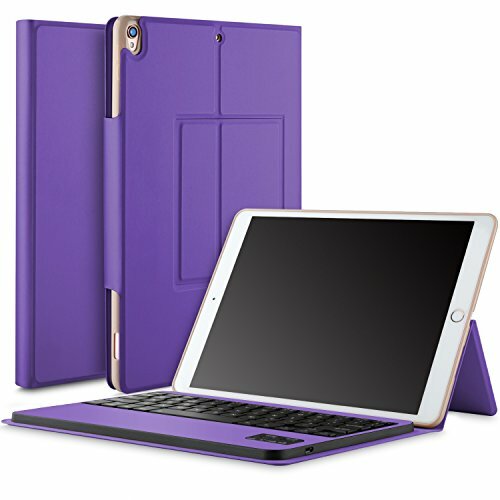 2.Please NOTE that the case would NOT fit any other iPad models. You can find the model number on the back of your iPad.